Now, we've seen some strange things when it comes to Bigfooting, but this really takes the cake — in a good way. Tim Stover (of the Ohio Bigfoot Hunters) spends his fair share of time in the woods of Ohio in search of the great beast. But what would happen on this particular day, would be like no other that Tim has ever experienced. 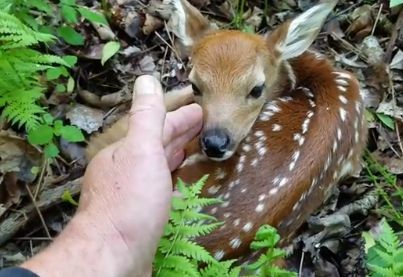 "Let me mention that I took part in a Fawn study in 2002 and my job was to locate and then help tag and take blood samples. Whitetail Deer species are not like some other animals that will reject the offspring if touched by humans. So don't be alarmed by what you see in the video."